The bond market is predicting PIMCO’s New Normal environment: slow growth, little inflation. The bond funds are signaling no confidence in the direction of US fiscal policy. Inflation is not the issue. The inflation-adjusted TIPS are showing very low real yields, close to real LIBOR. A strong recovery is not the issue. 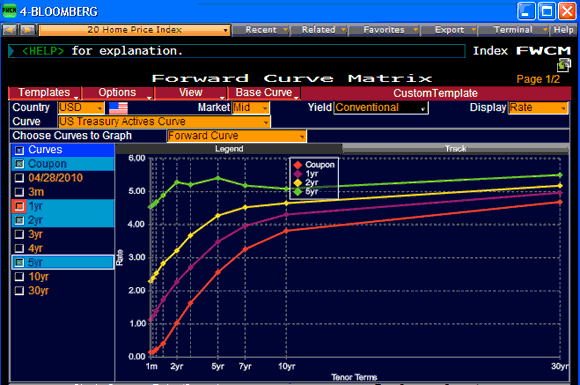 This chart from Bloomberg as analyzed by Calafia Beach Pundit shows the current yield curve in red, and Boomberg’s forward projections in purple (one year out), yellow (two years) and green (five years). The projection shows the Fed raising the Fed Funds rate to 1% in one year and 2.25% in two years on its way to 4.5%. These future curves show little to get excited about; real growth would drive the long end more steeply. The US deficits are the issue. The risk for bond investors is a rise in the longer rates due to the need to finance the huge deficits. After a flurry of poor auctions following the ObamaCare bill passing, the Treasury markets have settled down, at least for the moment. Yet this may be a calm before the storm. Is it ttime to exit the LQD & BIV?